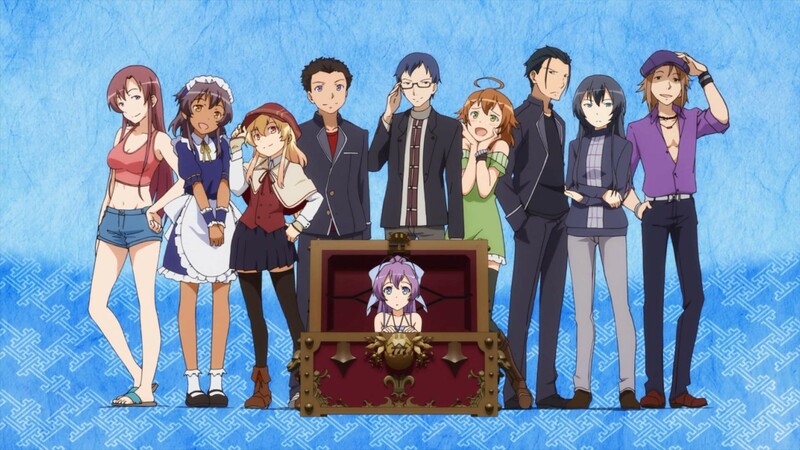 “Nanana’s Buried Treasure” (“Ryūgajō Nanana no Maizōkin”) is a good action-adventure-ghost show, as there are layers upon layers and everyone has a hidden agenda. Oh, and this also is a “move-in” show. Our hero, Juugo Yama, (fourth from left) comes to the “Special Student Zone” on the artificial island Nanaejima. Strapped for funds, he moves into an apartment, with the strange proviso of all the rent for a year up front. The reason? It is haunted by a previous tenant who was murdered there. This is Nanana (the one in the trunk) and she spent her living days hunting down strange and unusual treasures. In a sense, this is another ‘move-in’ show, but it takes a slightly different tack for it. 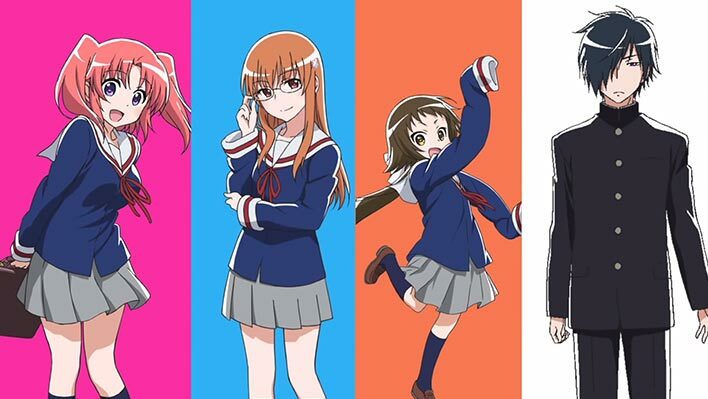 “Engaged to the Unidentified” (“Mikakunin de Shinkōkei”, “Unconfirmed & In-Progress”) tells the tale of Kobeni Yonomori (far left). She is a high school girl who lives with her mother and older sister Benio (next to her). Upon turning sixteen, Kobeni is shocked to learn that, due to an arrangement by her late grandfather, she is engaged to a boy named Hakuya Mitsumine (far right) who, along with his little sister Mashiro, (next to him) come to live with Kobeni. Talk about a move in, they not only come into the house, they come into the school and right into her class room (like you didn’t see that one coming, eh?). As Kobeni spends time adjusting to this new family, she learns there is more to Hakuya and Mashiro than meets the eye. This is one strange fish of a show, in the fact I think it is intentionally designed not to make any sense. 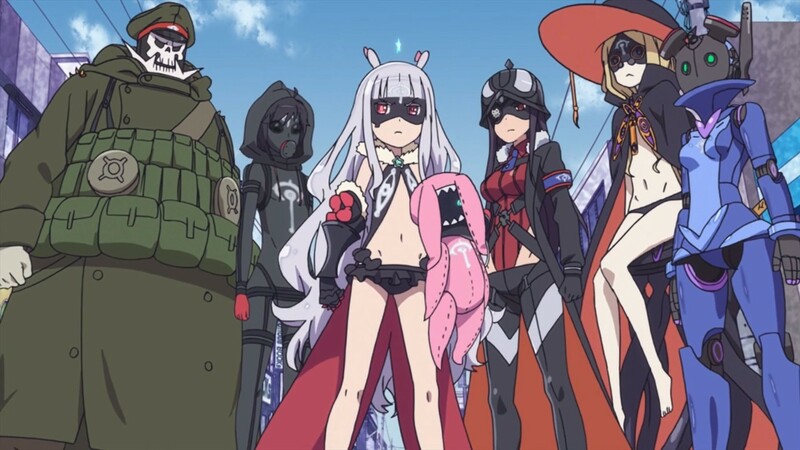 “World Conquest Zvezda Plot” (“Sekai Seifuku: Bōryaku no Zvezda”) confuses you right from the start, as the entire series is told as a giant flashback. We are greeted with a scene of absolute destruction and devastation. Is anyone left alive? Is the Starbucks razed? A lone figure wanders the shattered landscape, pondering the nature of world conquest and the people who do it. We are then transported back in time, to when things were sunny and clean and colorful and it all worked (sort of). Oh, and there IS a Starbucks. 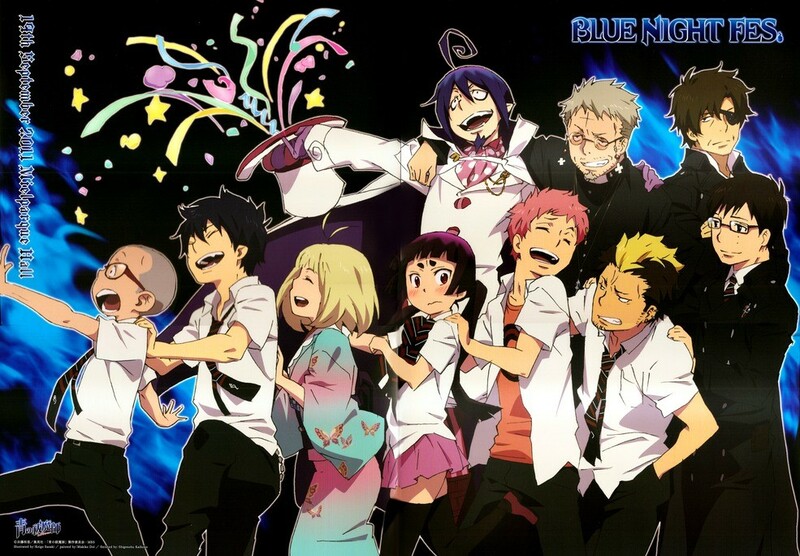 The title for this show is a tad misleading, in that “Blue Exorcist” does not approach exorcism as you think it should. Sure, these folks get rid of demons, but they do not necessarily possess people as much as they are free-form rovers that cross over and need to be sent off to the afterlife. We start off the show with Rin and Yukio Okumura (second from left and far right, both in front row) and their overseer Father Shiro Fujimoto (the guy with the cross eyeglass danglers). They learn that they are both the son of Satan, but it appears that Rin inherited all the power. Father is an exorcist and has been taking care of them since they were born. Well, since they are both now teens, they get those yearnings and itches…..to be on their own! What did you think I meant, pervert? However, Rin rebels against Father at a bad time and Father gets possessed by Satan, who is looking for an earthly vessel. Father takes care of that matter, but not in the best way for everyone involved. 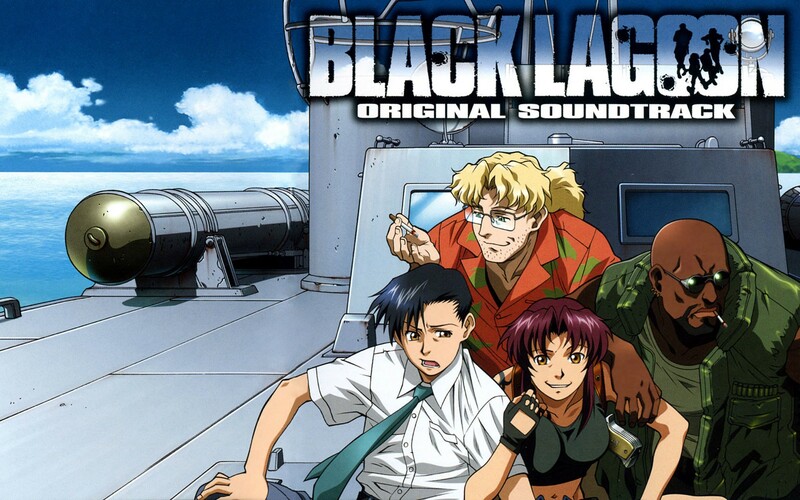 “Black Lagoon” is really a fine series, but understand that it is grim and gritty and violent and unrelenting, reminding me of series like “Gantz” and “Deadman Wonderland”, only not as graphic with the violence or destruction, but still with disturbing concepts and approaches. Our ‘hero’ (for lack of a better term; this anime is like “Payback”, where everyone is horrible, just varying degrees of it) is Rokuro Okajima, the decent-looking one up there. He works for the Asahi Company, who sent him out on a ‘project’. The ship he was on got hijacked and he was taken hostage, but the company wrote him off, not willing to do anything to save him. Since his options were to either sleep with the fishes or boat over them, he chose the latter and made “Black Lagoon” a quartet. 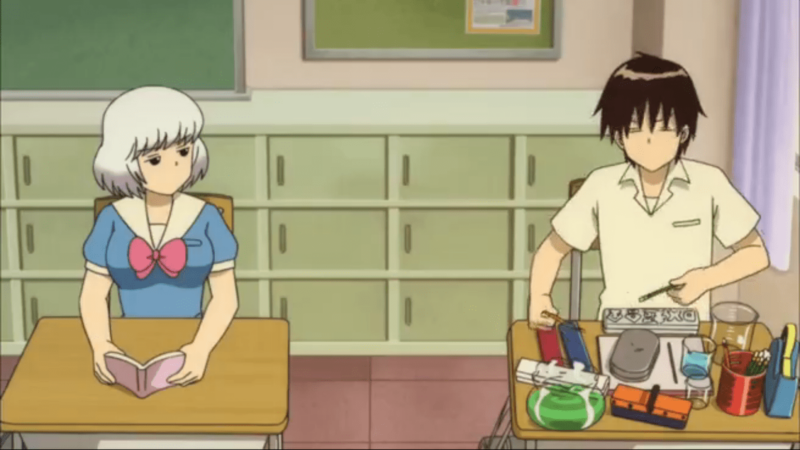 “My Neighbor Seki: The Master of Killing Time” (“Tonari no Seki-kun”) manages to pack a lot of story into a brief amount of time (each episode is about eight minutes long) and it tells the story about this guy, Toshinari Seki, who spends his class time not learning anything, and doing other, non-academic, things as well. Because he is in the far back right desk (near the window, last row), the teacher never sees his elaborate games and ‘experiments’ he does, rather than him learning about history or math. 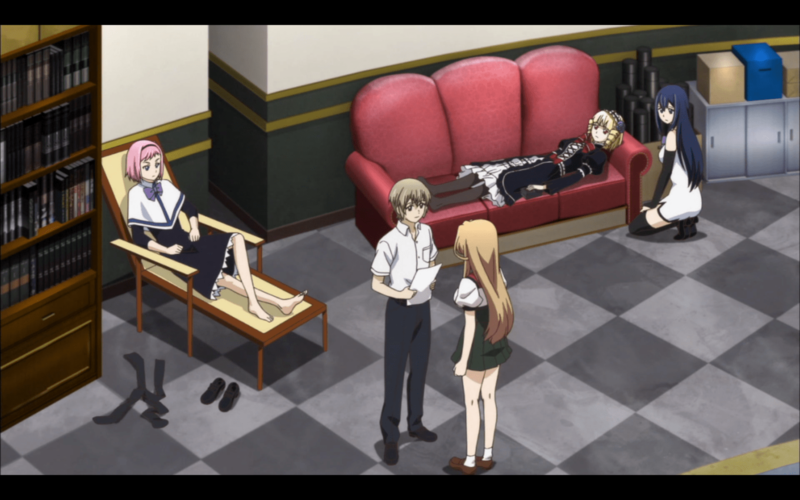 The young lady, Rumi Yokoi, is doing her best to study and learn, but Seki is so elaborate in what he is doing, she cannot help but get sucked into his schemes. She rarely participates, but she gets emotionally overwrought with the events on the desk next to her and neglects her class work as well.